Roster last updated on January 22, 2019. 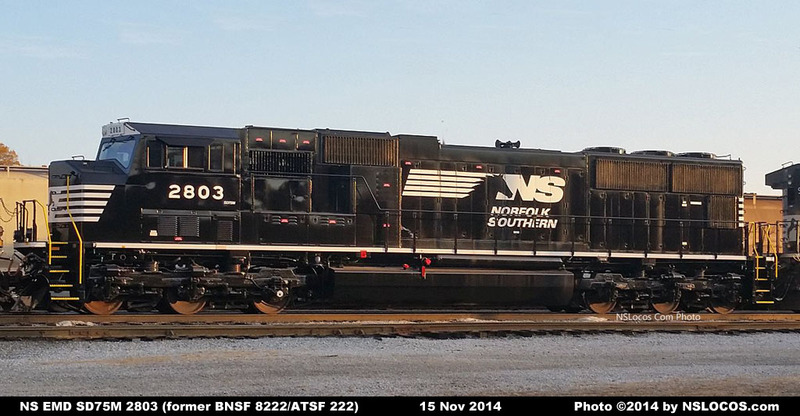 2800 BNSF 8202 ATSF 202 04-1995 946503 946503-3 Unit currently stored, but still on the active roster. 2801 BNSF 8209 ATSF 209 04-1995 946503 946503-10 Unit currently stored, but still on the active roster. 2802 BNSF 8218 ATSF 218 04-1995 946503 946503-19 Unit currently stored, but still on the active roster. 2803 BNSF 8222 ATSF 222 04-1995 946503 946503-23 Unit currently stored, but still on the active roster. 2804 BNSF 8225 ATSF 225 05-1995 946503 946503-26 Unit currently stored, but still on the active roster. 2805 BNSF 8229 ATSF 229 06-1995 946503 946503-30 Unit currently stored, but still on the active roster. 2806 BNSF 8230 ATSF 230 06-1995 946503 946503-31 Unit currently stored, but still on the active roster. Units were acquired in September 2014 via National Railway Equipment.